So did you know that Rue Mag now has a blog? So in case, like me, you can't get enough of their creative genius, you can get your daily fix here. I am also loving this post by Mackenzie of Design Darling. Obviously, I am a color addict. definitely loving the pops of bright color. that cream and orange top is so cute. and im definitely jealous that you are on your way to california! lucky lady. have a safe trip, Anna! i'm in LOVE with these color block designs! how great! Love love love Rue mag! Did not know they had a blog, so it is likely I will spend lots of time there while I am at work (hehehe). Great post and love the pops of color! Ahhh, say hello to California for me!! I miss home. Is this the spontaneous weekend you were referring to?? If so, Enjoy! I thought this collection was great. 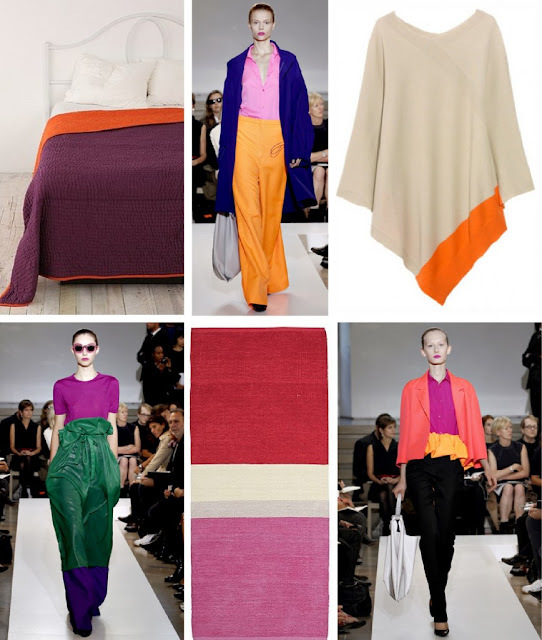 Not what one usually expects from Jil Sander, but the great colours are so what spring is about. it sure brought me some color ;) love the first pic. mix of white and pop! i've also been enjoying the rue blog. talented ladies over there. Happy New Year lovely lady! Cheers to a new year! I like the pink and orange together in the photos above, so different and pretty! Have so much fun! Get some great stuff for the shop! thanks for telling us about the magazine and blog! They are SO pretty! Have a safe flight! I so love colors - and these really brighten the day! What a great trend! Have a superfun weekend Anna, enjoy it!